Shimla is the capital of Himachal Pradesh and is one of the most preferred summer destinations for North India. Surrounded by magnificent mountains and lush greenery, it makes for a peaceful escape. The hill station served as the Summer Capital during the British Raj; hence, a heavy influence of Victorian-style architecture can be seen in every old construction. 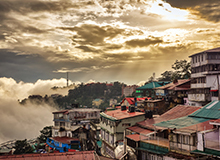 Shimla is thronged by tourists throughout the year, due to which there are numerous 3-star hotels in Shimla and 4-star hotels in Shimla catering to different requirements. As more and more travellers are now inclined towards budget trips, the demand for hotels that are easy on the pocket has also increased. FabEscape Shimla Knollswood is one such budget hotel in Shimla that is preferred by many travellers visiting the hill station. This and similar hotels in Shimla offer the best-in-class amenities, convenient locations and complimentary services, without having you to break the bank. 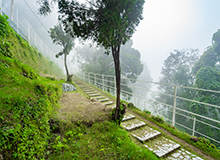 Shimla has many points of interest that keep visitors engaged throughout their trip. If you are looking for hotels in Shimla Mall Road, FabEscape Shimla Mall Road is the place to be. There are many other hotels in Shimla near Mall Road for every kind of traveller. From fresh fruit jams to Himachali handicrafts, there are tonnes of things that you can buy on your trip to Shimla. Shimla is not just about winding roads and pine-covered mountains, there are many tiny cafés and fine-dine restaurants to suffice the foodie in you. Even though Shimla is a hill station, that does not mean night owls have to compromise with having a good time. There are several nightclubs and pubs in Shimla where you can have your favourite drinks and show your best moves. Shimla is known for its extravagant celebration of the winter festivals. Being an important tourist destination, Shimla is easily accessible by all means of transport. By Air: Shimla has its own airport, Jubbarhatti, which is situated at a distance of 22 km from the city centre. 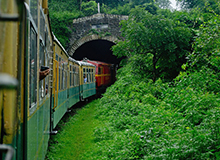 By Train: A mountain train runs between Kalka and Shimla, and the track has been recognised as a UNESCO World Heritage Site. Kalka is conveniently connected with New Delhi and other neighbouring cities. By Road: The National Highway 22 leads directly to Kalka. From there, it’s only a 2-hour drive to Shimla. There are many state-operated busses running between Delhi and Shimla. The months between March and June are considered the best time to visit Shimla. The weather is pleasant, and ideal for outdoor activities. Adventure lovers prefer this time as it makes for a perfect setting for trekking, paragliding, camping and rafting. Winters are cold and snow-laden, and those who love chilly winds consider the season as the best time to visit. Monsoon should be avoided as the roads leading to the hill station are susceptible to landslides. Why Book FabHotels in Shimla? There are countless hotels in Shimla suited for different budgets, requirements and localities. FabHotels has the best hotels in Shimla that provide a cosy and comfortable stay to travellers. All our hotels offer complimentary Wi-Fi and breakfast, clean and well-ventilated rooms, and modern conveniences. Our well-trained and hospitable staff ensures you have a relaxing and refreshing stay. If you are looking for Shimla hotels rates, you can simply check it here. Download our app for Android or Apple devices to make Shimla hotels booking on-the-go! Further, we keep launching new offers and deals for our guests to save more on their stay. A-list and Refer & Earn are two such latest programmes. Do explore our website to know more and save more! "The room was very good and the food was tasty." "Great service. Excellent customer orientation." "Nice & crisp stay with all expectation crossing 100% mark .."
"Very friendly staff esp at checkin & restaurant. Could not have been more helpful. Excellent rooms which were very spacious. Great housekeeping. Outstanding in all respects. quiet retreat away from the hustle & Bustle of city." "Great experience for 1 st time"
"Very spacious room. Hot water and tv." "BED WAS EXCELLENT. THE BATHROOM IS ALSO NICE"
"Staff are very caring and also food is very tasty."